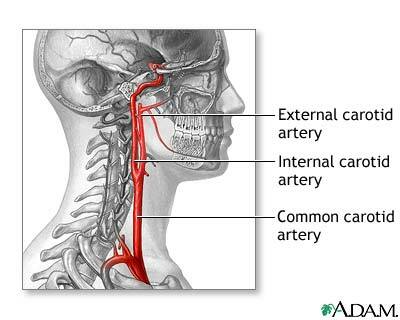 Extracranial to intracranial (EC-IC) bypass is a surgical procedure to increase cerebral blood flow. This procedure entails connecting a branch of the external carotid artery (usually the superficial temporal artery) to a branch of the internal carotid artery (usually the middle cerebral artery), either directly or via a vein graft. This procedure is similar to cardiac bypass surgery where blocked heart arteries are bypassed. EC-IC bypass has been available as a potential treatment for ischemic stroke for the past 30 years. There has been much controversy concerning this procedure due to a large study conducted in the 1980s. As a result, this procedure is only used in a very select group of patients. The indications for EC-IC bypass are severe stenosis or occlusion of intracranial arteries with focal neurological symptoms, such as weakness or speech difficulties. This procedure is also used when an artery must be surgically occluded for the treatment of unclippable giant aneurysms. In children and adults, this procedure is used to treat Moya-moya disease (a progressive narrowing of the proximal intracranial blood vessels). 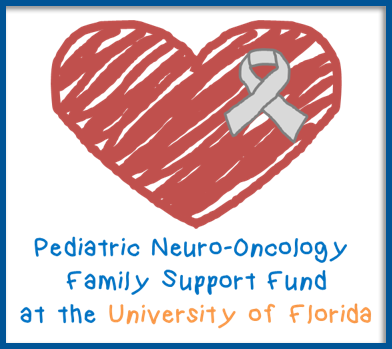 A craniotomy is performed to expose the intracranial vessels and the location of obstruction or giant aneurysm. 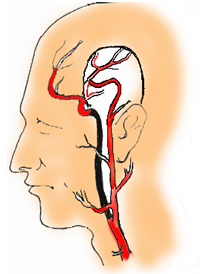 The donor artery is exposed (scalp or neck). If needed, a vein is harvested from the leg. The anastamosis is performed under the operating microscope. Once complete, the bypass is examined in the operating room with an angiogram.